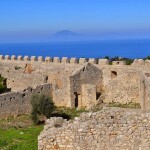 Chlemoutsi Castle is located in the westernmost promontory of the Peloponnese. It is built on top of the hill “Helones” and dominates the plain of Elis. 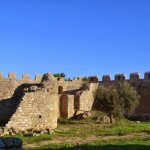 This is one of the most important and best preserved fortresses of Greece, an excellent example of castle architecture of the Franks in the Peloponnese. 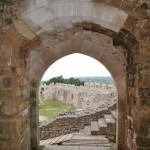 The main entrance is located on the northwest side and was originally a gate. The castle consists of two enclosures. The inner yard where was the residence of the prince, the chapel and accommodations for the guard is built on the highest point of the hill and forming a hexagon around a large central courtyard. 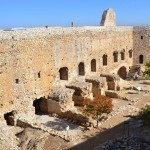 The external walls are ruins of buildings, tanks and a Turkish mosque. At the premises of the inner enclosure was the residence of the castellan or prince, lobbies, kitchens and accommodation for the garrison. 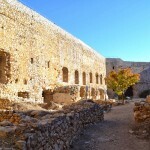 The conference had two storeys (excluding room G) and inside are preserved tanks, numerous fireplaces, similar to those of the peripheral buildings external enclosure, storage niches and spaces toilets. The entrance to these was via the inner courtyard and terrace with outdoor mason stairs. There were accommodated with tall semi-ellipsoid domes, which in combination with the openings with sunken dome and slightly pointed arches openings confirm the western origin of the founders of the castle. 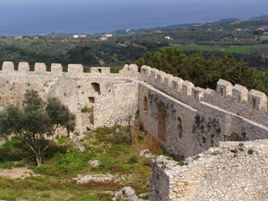 Two years, from 1220 to 1223, time record for the season, Geoffrey A Villehardouin needed to build the strongest fortress of the Frankish principality of Achaia. 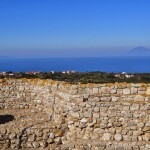 Located in a strategic position with extensive views of the plains of Ilia and the Ionian Sea, surrounded the capital of the principality ANDRAVIDA, the most important harbor of Glarentzas. At the time of Vilerdouinon named by the founders of Clermont and flourished. Chlemoutsi located in the village of Castro Kyllinis, the westernmost promontory of the Peloponnese. It is built on top of a hill that dominates the plain of Elis. 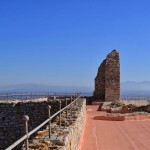 The castle was founded in 1220-1223 by Prince Geoffrey Villehardouin and became the strongest fortress of the Frankish principality of Achaia, which flourished during the era of Villehardouin. 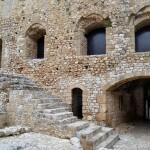 The new castle was named by the founders of Clermont, in Greek Chlemoutsi against corruption, while the Venetians later called it Castel Tornese because they incorrectly thought that here was the Frankish mint of Tornes. 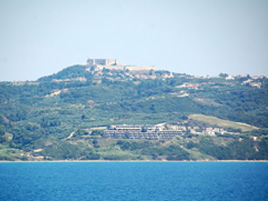 Located in a strategic position with extensive views of the plains of Ilia and the Ionian Sea, surrounded the capital of the principality Andravida and the important port Glarentzas. After the death of William Villehardouin follows a period of unrest that erupts intense disputes over succession to the principality and gradually led to the decline. Chlemoytsi becomes an object contended for various nobles. In this he is imprisoned and dies Margaret of Akova, because it was responsible for an assertion of Moria by Ferdinand of Majorca and the advent of the Catalans who occupied the castle in 1315. 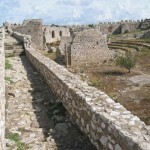 Chlemoytsi recaptured by the Franks, and remained in their possession until the early 15th century, when it passed into the hands of Charles Tocco, count of Cephalonia and Despot of Epirus. 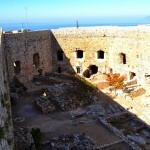 1427 came peacefully with Constantine Palaeologus, after his marriage with the daughter of Tocco, he used the castle as a military and administrative center. In 1460 the castle was occupied by the Turks, in 1867 by the Venetians, who kept it in their possession until 1715, when they lost it again in the hands of the Turks. 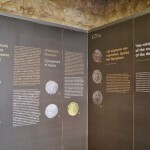 It seems that Chlemoutsi has been losing its important role in the defense of the region since the end of Frankish rule. In the 1701, Grimani proposed its destruction. The place did not serve the interests of the Venetians, who were associated with the sea, while the old castle already required extensive work for repair and modernization. Chlemoytsi remained in possession of the Turks until 1821. 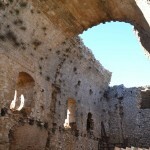 It suffered significant destruction during the bombing part of the 1826 Ibrahim destroyed a tower indoor enclosure and the wall near it, suggesting that the castle played a role in the Greek Revolution.